This is a gorgeous little pot! Lovely rural scene with horses around the body, with pretty floral board around the rim, and to the rim of the cover. The cover has a cut out for a spoon. Excellent condition. Blue printed backstamp. Lovely round pot on a fixed base. The cover has a spoon cut out. Backstamp: Landscape Adams Est 1657 England. There is a tiny firing fault at the base of the finial, overall excellent condition. A lovely little octagonal pot. It has discolouration around the inside rim otherwise fine. 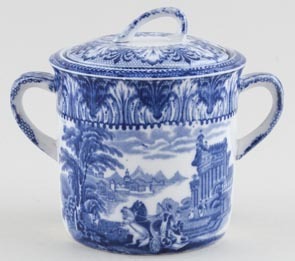 An attractive squat round preserve pot, the cover with cut out for spoon. Gilt line decoration to cover and pot. Excellent condition. Blue printed backstamp Booths over crown Silicon China and Made in England. Patt No 9760. A delightful small divided dish for butter one side and preserves the other. Backstamp: Booths Silicon China Made in England Netherlands. A little minor discolouration around the base of the divide otherwise excellent condition. With gilt. Backstamp: Booths Silicon China England Real Old Willow. Date of manufacture probably 1917-20. Small octagonal pot sadly with no cover. There is some some wear to the gilt and discolouration inside and underneath otherwise fine. Provenance: The Entwistle Collection. With gilt. Backstamp: Booths Silicon China England Real Old Willow. Date of manufacture probably 1917-20. Sadly lacking its lid, this straight sided pot is crazed with discolouration mainly inside and the gilt is very worn. Provenance: The Entwistle Collection. With gilt. A fabulous little straight sided lidded pot with has a spoon cut out. Backstamp: Booths Silicon China Made in England Real Old Willow and in script 9072. Light all over crazing with a little wear to the gilt and under the lid some wear and discolouration. With gilt. Backstamp: Booths Silicon China England Real Old Willow.D ate of manufacture probably 1916-17. This is a large straight sided pot with rounded base and the cover has a cut out for a spoon. There is a little wear to the gilt. The cover is crazed, has a hairline and the finial has a small chip but overall a lovely pot. Provenance: The Entwistle Collection. With gilt. Backstamp: Booths Silicon China Made in England Real Old Willow. Date of manufacture probably 1938-40. This lovely little pot is crazed with light discolouration, there is some wear to the gilt, mainly to the rim of the stand and a small chip under the rim of the cover. The cover has a cut out for a spoon. Provenance: The Entwistle Collection. A8025. 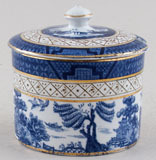 The lid has gilt decoration but the pot is plain blue printed. At some stage this appears to be a marriage of pot and lid though they sit comfortably together. A little smudging to the transfer. With gilt. Backstamp: Booths Silicon China Made in England Real Old Willow, with black printed Patt. No 9072 on the pot and T Goode & Co South Audley Street London on the saucer. Date of manufacture probably 1938-39 for the pot and 1937-38 for the stand This is gorgeous! 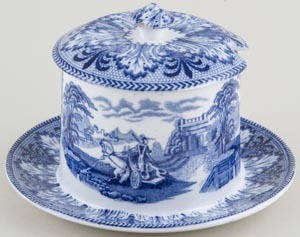 A straight sided preserve pot and saucer. The cover of the pot has a cut out for a spoon. The saucer has light crazing with a touch of wear to the gilt. The pot has a little discolouration inside and a touch of wear to the gilt on the finial otherwise excellent condition. Provenance: The Entwistle Collection. Delightful little dish with central divide and ochre rim. From the breakfast in bed set. Backstamp: Booths Silicon China Made in England These Colours Will Not Perish. A little very minor wear under the rim otherwise excellent condition. Lovely little pot sadly lacking a cover. Light crazing and some discolouration underneath otherwise fine. Would make a lovely small vase! Burleigh Ware. Originally introduced about 1913 as Chinese Peacock, but later known as Blue Bird. Cover has cut out for a spoon. Delightful little pot with a little minor wear to the cover otherwise excellent condition. Burleigh. With gilt. A very attractive pot. Crazed with some associated staining. A little wear to the gilt and just a couple of really minor nicks to the foot rim. Green printed Burleigh mark and pattern No. 3018 in script. With gilt. Backstamp: Burleigh Ware Willow Burslem England. Light crazing with some discolouration around the inside rim of the pot and the underside of the cover. With gilt. A delightful little dish with central divide and moulded side handles. Backstamp: Burleighware Willow England. Excellent condition. Made in England. Brand new and first quality, dishwasher and microwave safe. Blue Bird. There is a cut out in the lid for a spoon. This item has been discontinued by Burleigh and is no longer available. Made in England. Brand new and first quality, dishwasher and microwave safe. Dark Blue Calico. Jam pot with lid and ceramic spoon. There is a cut out in the lid for the spoon. Spoon 4.5 ins 11.5 cm. This item has been discontinued by Burleigh and is no longer available. Made in England. Brand new and first quality, dishwasher and microwave safe. Pale Blue Calico. There is a cut out in the lid for a spoon. This item has been discontinued by Burleigh and is no longer available. Made in England. Brand new and first quality, dishwasher and microwave safe. Dark Blue Chequers. There is a cut out in the lid for a spoon. This item has been discontinued by Burleigh and is no longer available. Made in England. Brand new and first quality, dishwasher and microwave safe. Red Chequers. There is a cut out in the lid for a spoon. This item has been discontinued by Burleigh and is no longer available. Made in England. Brand new and first quality, dishwasher and microwave safe. Pale Blue Felicity. There is a cut out in the lid for the spoon. Spoon 4.5 ins 11.5 cm. This item has been discontinued by Burleigh and is no longer available. Made in England. Brand new and first quality, dishwasher and microwave safe. Pink Felicity. There is a cut out in the lid for a spoon. This item has been discontinued by Burleigh and is no longer available. Made in England. Brand new and first quality, dishwasher and microwave safe. Blue Polka Dot and Rose. There is a cut out in the lid for a spoon. This item has been discontinued by Burleigh and is no longer available. Made in England. Brand new and first quality, dishwasher and microwave safe. Pink Polka Dot and Rose. There is a cut out in the lid for a spoon. This item has been discontinued by Burleigh and is no longer available. Made in England. Brand new and first quality, dishwasher and microwave safe. Blue Prunus. There is a cut out in the lid for a spoon. This item has been discontinued by Burleigh and is no longer available. Made in England. Brand new and first quality, dishwasher and microwave safe. Rosie's Hens. Printed on a delicate creamware body. There is a cut out in the lid for a spoon. This item has been discontinued by Burleigh, but is still available with a spoon. Made in England. Brand new and first quality, dishwasher and microwave safe. Dark Blue Victorian Chintz. There is a cut out in the lid for a spoon. This item has been discontinued by Burleigh and is no longer available. Made in England. Brand new and first quality, dishwasher and microwave safe. Pink Victorian Chintz. There is a cut out in the lid for a spoon. This item has been discontinued by Burleigh and is no longer available. This is a wonderful little piece. Small round pot on a fixed stand with a cover with a cut out for a spoon. Superb condition. Blue printed backstamp: Cauldon Ltd England, Brown Westhead Moore & co Est 1774 Blue "Moore"
Lovely little round pot on fixed base. Outwardly this looks perfect however close inspection reveals that the inside iis stained and there is a very small chip to the rim. The cover from the top looks fine, but underneath it is also stained and has two small chips to the rim. A wonderful display piece! Lovely little round pot with cover on a fixed stand. The cover has a cut for a spoon. Backstamp: Cauldon England. Lovely little pot with side loop handles and central loop handle to cover. There is a long chip and tiny hairline, plus a tiny nick on the inner rim of the lid, which is inside the pot, when the lid is in place. Outwardly everything is fine and otherwise in excellent condition. Typical blue printed backstamp. This is a fabulous little round preserve pot on a fixed base. The cover has a cut out for a spoon. There is just a touch of crazing to the cover otherwise excellent condition. With gilt. Gorgeous piece with ornate handle and spoon cut out in the lid. Backstamp: Cauldon England Est 1774. The base has light all over crazing. The lid has a little minor wear underneath otherwise excellent condition. Brand new and first quality china, which is dishwasher safe. This item has been discontinued by Churchill, but limited stocks remain available. A delightful little pot on a fixed stand. Backstamp: Old Chelsea Furnivals Limited Trade Mark England Rd No 647812. There is a tiny tiny manufacturing fault to the rim of the pot otherwise excellent condition. What a delight! 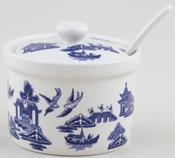 A small lidded pot with gently flared base printed in a soft blue. The delicate little lid has a pretty loop handle and has a spoon cut out. Backstamp: Willow Gibsons & Sons Ltd Burslem England and impressed England. Excellent condition. Made by Woods for Hales Hancock and Godwin who were retailers. Crazed with a little discolouration. With gilt. A superb very small preserve pot the lid with an opening for a spoon. Backstamp: Hammersley & Co Longton Stoke on Trent England E570. There is a little discolouration to the finial on the lid otherwise excellent condition. A G Harley Jones of Fenton produced their version of Booths Real Old Willow in the late 1920s and early 1930s. The glaze is lightly crazed, but otherwise in lovely condition. Blue printed backstamp. E Hughes, Paladin China. Bone China. There are a few minor stress "cracks" to the rim of the pot and just a hint of discolouration to the pretty loop handle and inside rim of the cover. Cover has a cut out for a spoon. Lovely little piece. Old Ribbon Backstamp. Small hairline crack to top rim. Item AB65 in Jones Catalogue. Backstamp: G Jones & Sons England Abbey 1790. Crazed with a little wear underneath the cover. Item AB65 in Jones Catalogue. Backstamp: G Jones & Sons England Abbey 1790. A little wear to the rim of the pot otherwise excellent condition. Usual blue printed backstamp. The base has one small area of light staining to the inside of the rim, also some around the foot, where underneath it appears to have suffered a very small knock. There is the tiniest of nicks to the spoon cut out on the cover. Usual blue printed backstamp. This probably would once have had a cover (lid), however is a gorgeous little piece in its own right. In superb condition and printed in a lovely soft blue. A most unusual item in Abbey the standard honey pot but with a fixed stand. Shape AB10 in the Geo Jones catalogue. There is a very small possible hairline inside to the base of the pot but this does not show through, otherwise lovely. Impressed date for 1932. Lovely rural scene either side of the body and to the cover on this pot. Backstamp: Woodland, G Jones England. A little wear to the inner rim of the cover otherwise in excellent condition. Lovely rural scene either side of the body and to the cover on this pot. Backstamp: Woodland, G Jones England. There is a little minor wear to the inner rim of the cover otherwise excellent condition. James Kent. A lovely little preserve pot with epns cover. A little light staining inside the pot otherwise good condition. Not marked but definitely James Kent.